We originally intended on spending just over a week in Arequipa but ended up being there for over two weeks. Tired of Cusco’s freezing nights and jacked up prices, we headed to Arequipa to take a week-long Spanish course and to hopefully finish with a trip up Misti Volcano. Once we arrived, we quickly realised that there was much more to do in this picturesque city with a mild spring-like climate. Simply enjoy walking around the city’s famous white-walled city centre by yourself or as part of a walking tour. No tour of the city is complete without a visit to the Plaza de Armas where there are always performances and festivals of some kind. There are plenty of restaurants nearby but you will get better value by looking for somewhere to eat farther away from the square. Arequipa has some great city parks and green spaces where flowers grow, birds sing, and alpacas trim the grass. Lace up your shoes and go for a walk or run in one of these green spaces for a nice outing. The 5th floor terrace is a nice place to have a drink while the sun sets over the Plaza de Armas. Many other hotels and restaurants have rooftop terraces as well. 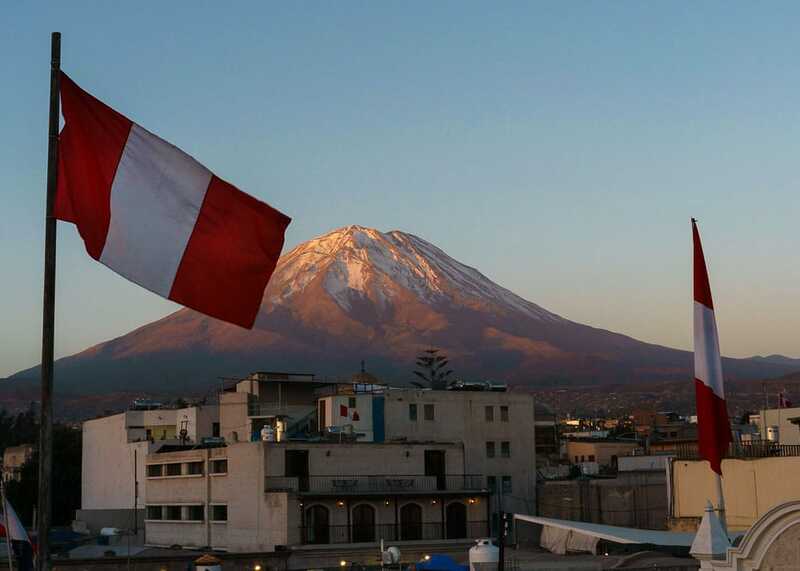 The sunset in Arequipa always seems to be beautiful as it lights up Misty, Chachani, and Pichu Pichu so you’ll want to watch it most nights you’re in the city! These restaurants feature the best of local cuisine and offer sampler plates called “Americano” or “doble“, which include small portions of multiple dishes such as potato cake (pastel de papa), stuffed peppers (rocoto rellena), and beef stew among others, so you can sample a few flavours. As the story goes a young American women was at one of these Picanterias and went up to their traditionally open kitchens asking to try all the different dishes. The chef rolled his/her eyes and put a bit of everything on a plate for her to try and called it an Americano. La Capitana and La Nueva Palomino are two good options. 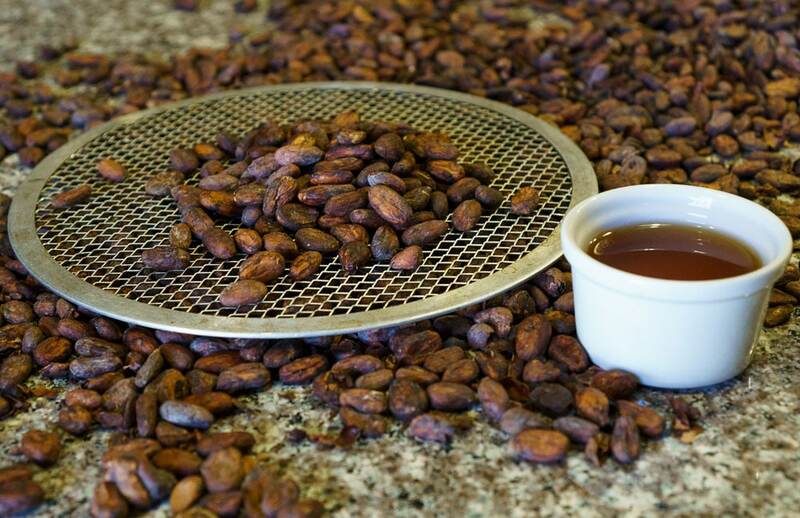 Adrien from Chaqchao will spend a morning or an afternoon teaching you how to tell the crap posing as chocolate from the real thing and then you will get to make your own chocolates. 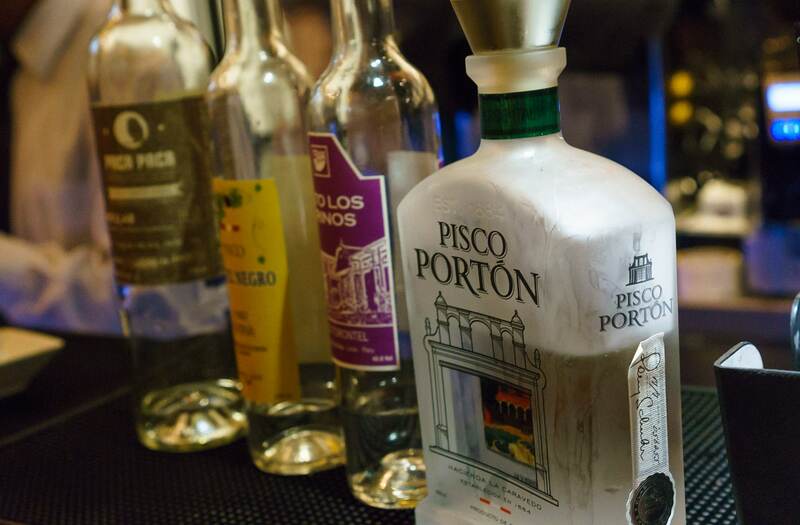 This place is less museum and more cocktail bar, but they do a great tasting experience where you can sample different kinds of Pisco and finish the experience with one of their signature cocktails. The Monasterio Santa Catalina de Siena was described to us a “city within a city” but we skipped it because we thought the 40 sole entry fee was a bit too high and opted to drink craft beer instead. That said, those we met who went, said it was pretty cool. The Incans used to make child sacrifices to appease their Gods which is a practice that has mercifully ended. Juanita the Ice Maiden’s corpse was discovered high on Ampato Mountain after being sacrificed there sometime between 1450 and 1480 and covered in glacier ice until her discovery. She is on display at the museum to teach people about Incan culture. We spent a week brushing up our Spanish skills with the great teachers at Rocio Language Courses for about $100 per person per week. The Mirador de Yanahaura is in the picturesque Yanahura neighborhood, that features cobblestone streets, white stoned architecture, and a quieter feel than Arequipa. The arches of the lookout frame the peaks of Misti, Chachani, and Picchu Picchu and are a great place to watch the sunset as well. 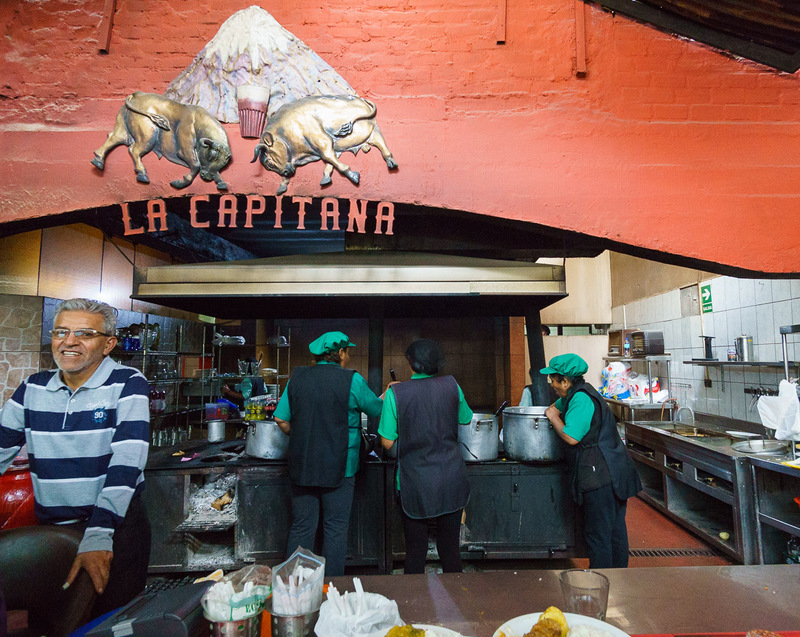 The neighbourhood is also a great place to find a picanteria to try out some delicious local food. We booked last minute with Quechua Explorer and rode bikes from the city centre to a rock wall just outside of town where we climbed beside the chili river. Some of the bikes had seen better days so make sure that you double check your equipment before departing. Enjoy an afternoon of whitewater rafting on the Chilli River in grade II and III rapids for only around $30usd. 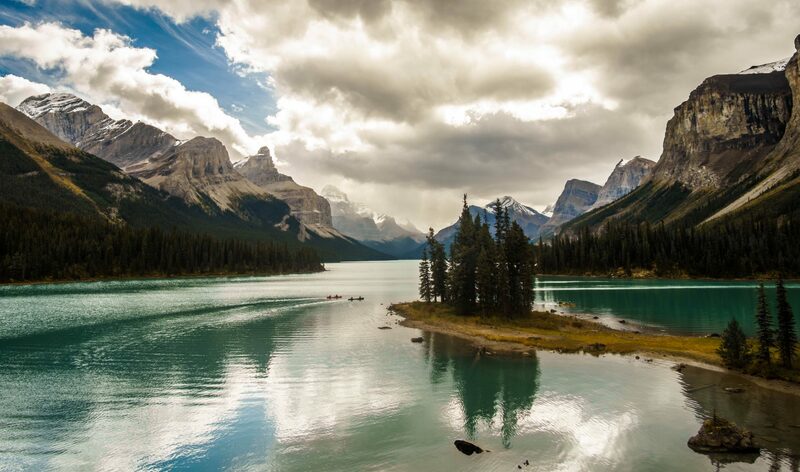 The river valley is just outside of the city so tours leave three times daily. 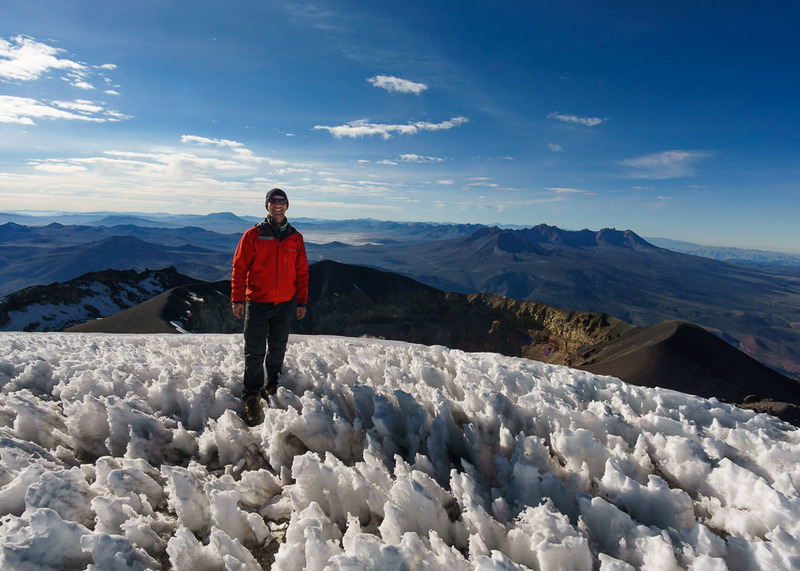 Spend 2 days hiking up the volcano that looms over Arequipa’s horizon. With an altitude of 5,822m the climb is tough but doable with a decent degree of fitness and good acclimatisation. The summit bid begins with a 1:00AM wake-up but eventually rewards you with amazing views as the sun rises over the city below. We booked with Tahuantinsuyo Tours in the Plaza de Armas for about 70USD each. The Colca Canyon is understandably one of Arequipa’s biggest draws. It’s one of the deepest canyons in the world and features incredible dark night skies, and breathtaking vistas, including one where majestic condors cruise by. It can be done as a DIY but it’s almost less expensive to go with a tour at $45usd for a 3 day tour. Our guide was excellent and taught us a lot about the local culture and flora and fauna. We booked with Tahuantinsuyo Tours in the Plaza de Armas. As most agencies work together to fill a trip it doesn’t matter too much who you book with. 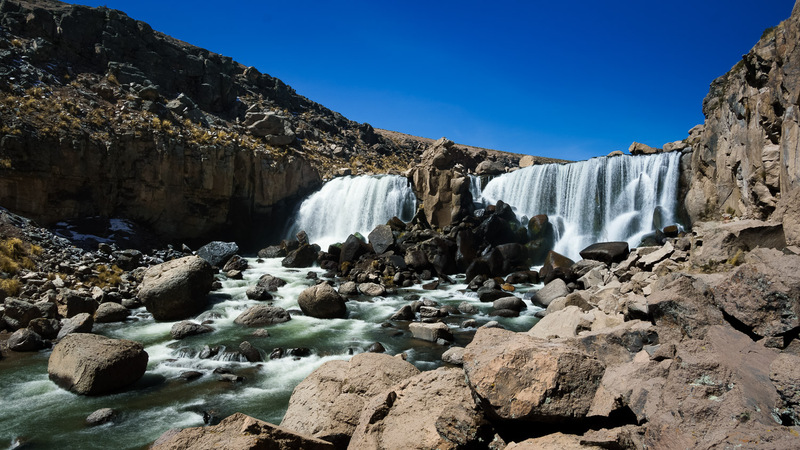 Take a day trip to a waterfall and fascinating countryside around Arequipa. You will likely spot some vicunas along the way. We booked with Cevitur Travel Agency for around 45 soles each. There are several other tours to consider such as local cooking classes, other hikes such as Chachani, and mountain biking down Volcano Misti. We visited CBC more times than we should have during our stay in Arequipa. Their delicious craft beers and fantastic burgers and fries are not to be missed. 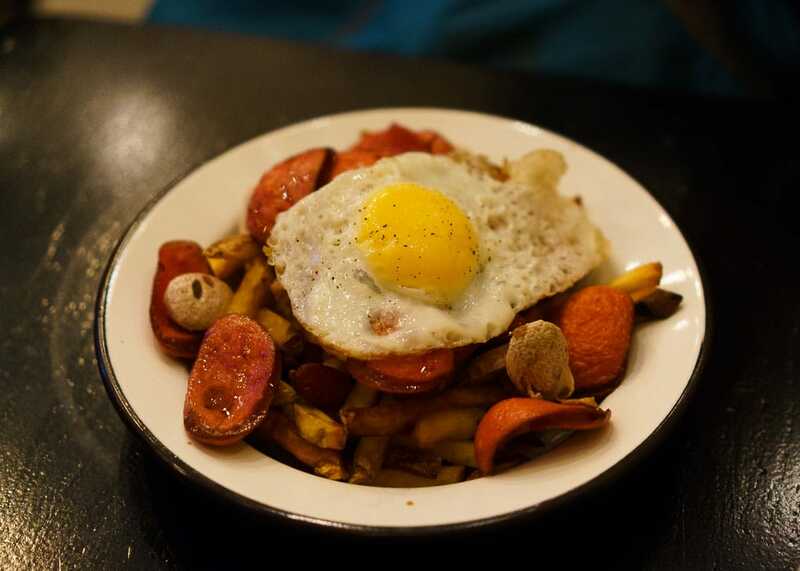 They also do a mean salchipapas (potatoes and sausages that’s kind of like Peruvian fast food). Close to the Plaza de Armas this place had great pizza and beer on tap which was perfect for the night we arrived. Their pale ale was particularly delicious. As the name implies, it’s aimed towards the Gringo crowd and it was a little bit on the pricey side. 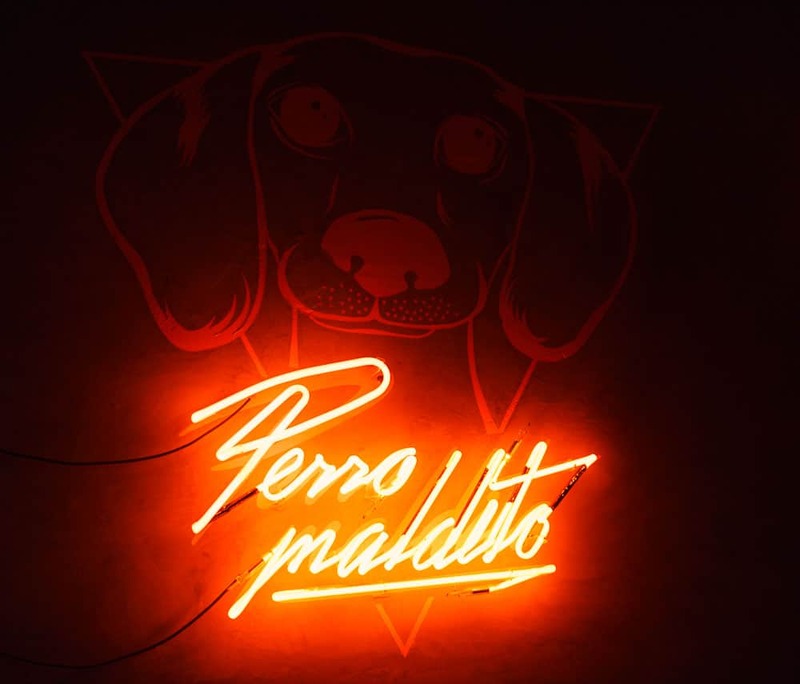 Very near Chelawasi is Perro Maldito, a cute small place with great music (we like to think that we improved their playlists a little! ), two in house beers on tap and hot dogs with all kinds of fixings. Here you can dine on unbelievably delicious build-your-own fresh-made pastas that come with salad and bread for very reasonable prices. I tried to stop halfway and save some leftovers but I could not. This French-owned restaurant is a great place to go if you’re craving a brunch just like back home. We had a delightful eggs benedict that rivalled the brunches of Bridgeland, Calgary’s brunch neighbourhood. Everything at this little restaurant revolves around the potato and you can try out up to 7 different kinds of Peruvian potatoes with a variety of toppings. Located close to the Plaza de Armas this restaurant makes for an interesting lunch option while you’re exploring the city. 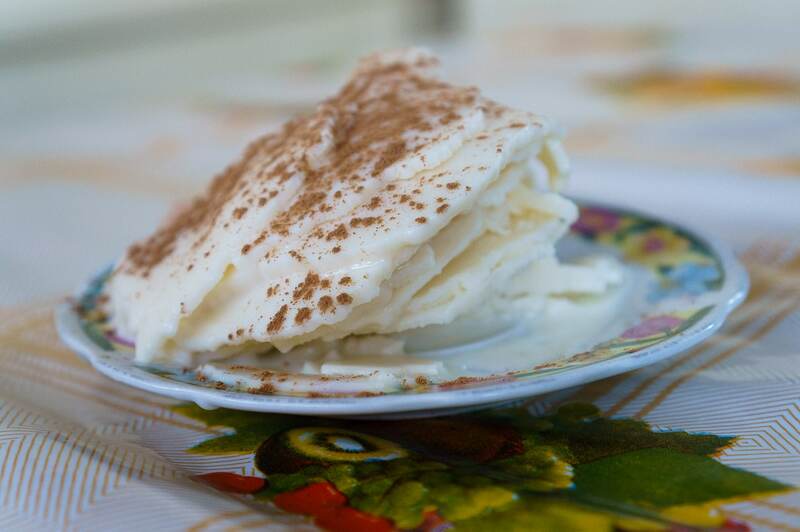 There are many cheap and tasty places to have a good almuerzo in Arequipa. Be sure to try the chupe de camaron (shrimp soup) if you see it, as it’s a local speciality. There is a really good one on the same side of the street as Rocio Language School that is inset off the sidewalk in a small mall on Calle Ayacucho, as well as one across from the school that’s good enough for a 2 course lunch for less than $4usd. Here you can get any combination of refreshing fresh-squeezed juices, either made entirely of fruit or with mixins like milk, yoghurt, and even beer. Be sure to try an arequipena papaya smoothie that’s made with a variety of papaya that’s endemic to Arequipa. We stayed in Villa Melgar which is a nice option with hot showers (depending on the floor), good-sized rooms, occasionally fast wi-fi (again, it depends which floor you’re on) and a convenient location that’s only a short walk to the market and main square. Doubles cost about 25-30USD. We also spent some time at La Recoleta in Yanahuara which is another good value option in the quieter neighbourhood across the river. We loved Benito, the beautiful orange resident cat, and the beds were very comfortable. It lacked hot water, but the wi-fi was generally good. Doubles cost 20USD. 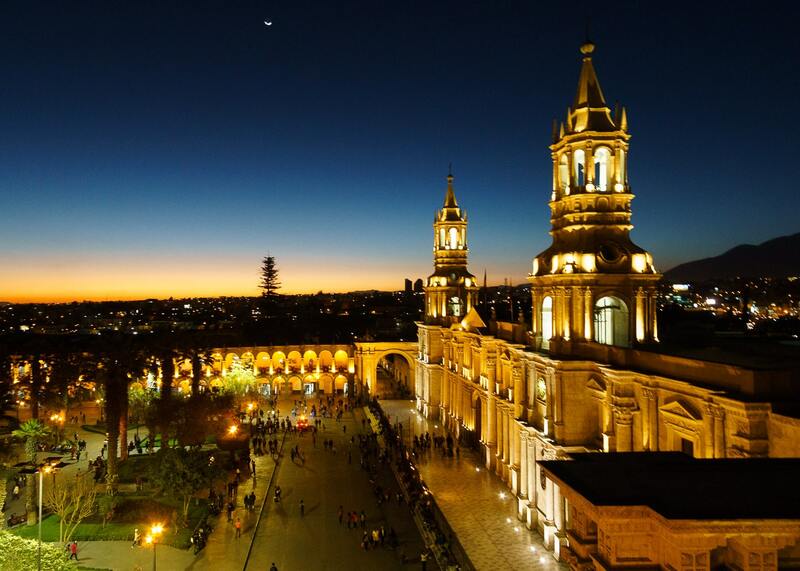 So there you have our guide to Arequipa, a beautiful city that features gorgeous architecture, endless outdoor pursuits, and a lively food and drink scene that blends tradition with innovation. You might end up staying longer than planned! P.S. If you do, please help us solve the mystery of why the garbage trucks play “Under the Sea!” We figured out why they do it – so people know they’re on the street and can run out with their garbage, but why the song Under the Sea? What does it mean? Let us know what you think in the comments!